Three local inuit men on the edge of the wild near Ilulissat, Greenland. Scale is an important compositional element that can add to the descriptive aspects of your photography. This simple means that by including a sense of scale in your photographs you can better tell the story you want to tell. I found these three likely lads near the beginning of a hike on the outskirts of Ilulissat in Western Greenland. Most of the walk skirts around the edges of the wonderful Ilulissat Icefjord. 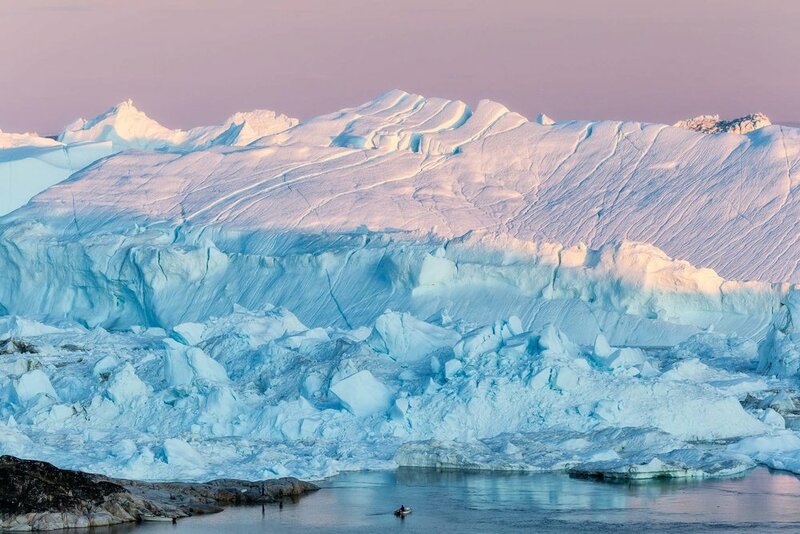 While these are not particularly massive icebergs, adding the human element does provide an indication as to their size relative to the inuit locals in the foreground. While a spectacular location, the bergs in the photo at the top of this post are not your classically shaped icebergs. Likewise the contemporary clothing worn by the guys, and the fact that their backs are to the camera, make it hard to interact with them in a meaningful way. While the location is exotic, for someone from my neck of the woods, I had to rely on composition to produce an interesting image. Fortunately there were three lads, and it’s often easier to build a good composition around odd numbered groups. I made four photos of this scene, all the while waiting for the guys to separate enough from each other to suggest a triangular shape. I also figured that, being guys, at least one of them would throw a stone into the water. It’s a small thing, but probably just enough to add a sense of action into an otherwise static image. A fisherman and his boat is dwarfed by massive icebergs on the edge of Disko Bay near the town of Ilulissat in Greenland. People often confuse knowledge with experience. In the world of photography, knowledge could be taken to mean technical prowess with camera and software. Frankly, technical prowess isn’t always enough. A great wildlife photographer needs to combine solid technique with an understanding of animal behavior. It’s that broader knowledge that will often get you to the right location, in the right season and at the right time of day to make the most compelling images. A family and a fisherman by the shores of Ilulissat, Greenland under the midnight sun. Needless to say experience comes over time and, in the case of landscape photography, is acquired by being out in the world making photos. And, of course, experience is gained through making mistakes, learning from those mistakes and taking action to avoid them in the future. It’s great how, by adding the human element, subject matter within a simple landscape study can be better understood. The human element also introduces more potential to the story you wish to tell. In fact such an addition can very much effect the story or message (e.g., man’s interaction with the environment) contained within the picture.